The e-Pulse® Workout Bundle is the ultimate package for increasing your energy levels, exercising and toning muscles, and providing an active session that mimics a real workout and provides similar results. It includes the e-Pulse® Ultra, e-Pulse® Workout Belt, e-Pulse® Massage Brace, e-Pulse® Arm Band, and e-Pulse® Lifetime Warranty Pack. EMS (Electrical Muscle Stimulation), also known as Myostimulation, provides athletes and body builders the ability to isolate and target specific muscles to actively work the muscle and build muscle mass. e-Pulse® Ultra gives a competitive edge to professional body builders and an effective strengthening and recovery tool to all athletes. 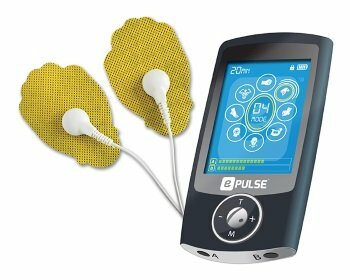 e-Pulse® Ultra is the portable solution for sessions at the gym, at home or on the go! Learn more. The e-Pulse® Workout Bundle is the ultimate package for increasing your energy levels, exercising and toning muscles, and providing an active session that mimics a real workout and provides similar results. Ideal for relieving pain associated with sore and aching muscles in the shoulder, waist, back, upper, and lower extremities. Out strongest TENS unit ever! The e-Pulse® Arm Band is an excellent addition to your e-Pulse® Ultra. Wrap it around your arm and take your massager with you for a run or a walk.